We’d love your help. Let us know what’s wrong with this preview of The Last Place on Earth by Roland Huntford. To ask other readers questions about The Last Place on Earth, please sign up. In the spirit of Manny I think it's important to immediately point out some parallels with Knausgard. Is there anything more heroically pointless and more boring than polar exploration? I don't mean for science but just rushing to the pole to say you've stood there. For Norwegians to get the world's attention, they have to do something huge and monstrous. Something spectacular that others have only dreamed of or dismissed as ludicrous. One can see Knausgard (that face! the intensity! those crags In the spirit of Manny I think it's important to immediately point out some parallels with Knausgard. Is there anything more heroically pointless and more boring than polar exploration? I don't mean for science but just rushing to the pole to say you've stood there. For Norwegians to get the world's attention, they have to do something huge and monstrous. Something spectacular that others have only dreamed of or dismissed as ludicrous. One can see Knausgard (that face! the intensity! those crags and ridges!) as a sort of Nansen of the page, an Amundsen of the pen, fighting his way to his own South Pole (so to speak) with demoniac fervour and holding the results to the world's nose in triumph. Sharp corrective here to the Scott I remember from many a school assembly. The noble hero of the Antarctic. As depicted here (an utter hatchet job but a well-documented one) Scott led his men to death because he was arrogant, ignorant and wholly unprepared. Thinking British pep and vim and upper lip were all that's needed. Not bothering to learn to use skis or dogs. Insisting on man-hauling (agonising, inefficient) and ponies (utterly useless on snow). Not planning his depots. Not leaving any margin of error. Determined on ludicrous heroism for its own sake. Deciding at the last minute to take 5 men instead of the planned 4 to the pole, inevitably leaving food and fuel short. Amundsen on the other hand having spent decades learning snowcraft and icecraft, having the humility and good sense to learn from the Esquimaux and the Inuit, adopting their diet, their clothing, their techniques and equipment. Planning depots meticulously. Building in a huge margin of safety. His lean and hardened team of experts (including, in Bjaaland a world-champion cross-country skier) a brutal contrast to Scott's glory-seeking misfits, incompetents and tyros. As the Times of London was to sneer, “professionals”. For Scott, the author puts it biblically: TEKEL; Thou art weighed in the balances, and art found wanting. Scott, slogging through the snow while Fridtjof Nansen casually screwed his (Scott's) wife in a Berlin hotel. As the author brutally has it, Scott was adopted as a hero in failure and death – a hero for a nation of losers, a necessary hero for a dying empire, a shining example of pointless self-sacrifice for the great war to come. A fascinating book. Much here not touched upon. Recommended. Reading this book ignited my interest in Antarctica and literally changed my life. I took up mountaineering, winter camping, and cross country skiing because of this book. On Dec. 24, 2004 I stood at the South Pole after a ski journey of 73 miles (a bit more than the Last Degree of latitude). What an incredible book. I was blown away with how much I liked it. It was incredibly well-researched and well presented historical drama. The author had very obviously done his homework and knew the topic well. It was a long read for me, and took quite a while to get through. It's not a fast-paced thriller novel, so there were parts when I would sit down to read it and fall asleep after only a few pages (though that may just mean I'm usually a busy and tired guy). The first 3/4 of the book was What an incredible book. I was blown away with how much I liked it. It was incredibly well-researched and well presented historical drama. The author had very obviously done his homework and knew the topic well. It was a long read for me, and took quite a while to get through. It's not a fast-paced thriller novel, so there were parts when I would sit down to read it and fall asleep after only a few pages (though that may just mean I'm usually a busy and tired guy). The first 3/4 of the book was like that for me, but the final 1/4 of the book, the part that dealt with the actual journey of these two men to the south pole, I read in just a few days because I liked it so much. I pulled a couple very late nights towards the end of the book. The author presented this history not pretending to hide his own biases. He was very obviously impressed with Amundsen's leadership style, his preparation and technical knowledge. He quite obviously loathed Scott's leadership style and his inept ability at polar exploration. To be fair though, he has the data to back up his conclusion, and I found it difficult to not side with the author in admiring Amundsen and his preparation, leadership, and optimism. I will admit that I found the account of Scott and his 4 companion's deaths one of the more sad deaths I have ever read. Notwithstanding the evidence that Scott's ignorance brought their deaths upon them and that it could have been prevented with a bit of foresight, I felt an amazing sadness for those men. The author describes well, their state of mind as they raced against odds to safety, as they slowly began to realize that they were in a race for their very lives. When they finally realized their own deaths were imminent and that no help was forthcoming, they hunkered down in a tent and for nine days burned through their remaining fuel and food while furiously writing letters and journal entries. I can't even imagine what must have gone through their minds. This book is many things: the story of the race to the South Pole, a dual biography of the rivals, Englishman Captain Robert F. Scott and Norwegian Roald Amundsen, adventure and exploration of the Antarctic, and above all a tale of leadership--superb and inept. The book, which the New York Times book review called "one of the great debunking biographies" was greeted with outrage in Britain, where Scott had achieved mythic status. Scott, who Huntford called "muddle-headed" and a "bungler" embodie This book is many things: the story of the race to the South Pole, a dual biography of the rivals, Englishman Captain Robert F. Scott and Norwegian Roald Amundsen, adventure and exploration of the Antarctic, and above all a tale of leadership--superb and inept. The book, which the New York Times book review called "one of the great debunking biographies" was greeted with outrage in Britain, where Scott had achieved mythic status. Scott, who Huntford called "muddle-headed" and a "bungler" embodied the spirit of "self-sacrifice." A naval officer who was the epitome of "regimented mediocrity" Scott only became a polar explorer to jump start his stalled career. Huntsman couldn't paint a more stark contrast than that between Scott and Amundsen. Amundsen didn't drift into polar exploration, it was his dream since a teen. Where Scott improvised, Amundsen carefully prepared; he sought men who would take initiative, rather than passively receive orders. Rather than embrace self-sacrifice and suffering as an ideal, Amundsen attacked the problem of polar exploration rationally and efficiently. For him, "adventure is just bad planning." He used skis and dogs; Scott used "man-hauling." It was almost comical at times to read of Scott's mistakes and utter incompetence after having read about how Amundsen led his expedition. Or it might have been, if it wasn't so tragic, such a sheer waste in every sense of the word. When people ask me about my all-time favourite book it takes about a second and a half for me to reply The Last Place on Earth by Roland Huntford. At one time I would then launch with no further prompting and usually to the distress of my listener on a reverent summary of Huntford’s masterful retelling of the classic tale of Scott and Amundsen’s 1911/1912 race to the South Pole. And in the 20 years since discovering this literary gift I still give the book as my all-time favourite but, fortunate When people ask me about my all-time favourite book it takes about a second and a half for me to reply The Last Place on Earth by Roland Huntford. At one time I would then launch with no further prompting and usually to the distress of my listener on a reverent summary of Huntford’s masterful retelling of the classic tale of Scott and Amundsen’s 1911/1912 race to the South Pole. And in the 20 years since discovering this literary gift I still give the book as my all-time favourite but, fortunately for anyone who still asks, I have quit trying to do justice to Huntford’s book by pinning them into a corner and expounding on its merits with my eyes closed. A few weeks ago, however, I made my third vicarious journey with Huntford to Terra Australis Incognita and was moved to purge myself one last time of the sentiment I have for this skillfully crafted biography. A decade into the Twentieth Century the romance of Britain’s Victorian Era was little more than a fond memory and the nation’s self-esteem lay bleeding on the abandoned ground of the once mighty Empire. While the Edwardians were quietly dropping their heads and rising to leave their seats, an Arthurian hero walked into the world theater and a new hope for the revival of England’s national consciousness took the stage. A son of the crumbling Empire Robert Falcon Scott took up the sword for a people starved for a conqueror. Outwardly confident and undeniably brave he was an almost unbreakable fighter but cursed with critical flaws that carried the seeds of his own death. Driven by a fear that his countrymen could not see and could never abide Scott left his home in 1911 in an ill provisioned and leaky boat with the weight of Britannia on his shoulders and the lives of his fellow expeditioners in his hands. His goal - to stand on the last great undiscovered place on Earth and to retrieve there by placing his feet and his country’s flag upon it both his own self-respect and Britain’s national glory. In the wings behind Scott, however, lurked his nemesis Roald Amundsen. Calculating, confident, efficient, and hardened by experience - like his homeland in the white north Amundsen was cold and brutally intense. The Viking son of a nation struggling for a voice at the world table, and a protégé of its people’s last hero turned reluctant diplomat, Amundsen came forward to take the mantle of Nordic conquest from Nansen’s failing hands with every intention of snatching Scott’s victory from his. And so the stage is set, and no fiction writer could have crafted the tale that follows any better than the way that these two men and the characters that supported them carved it in reality. It is a classical drama that incorporates all of the best elements of a good story: a moral message, a noble quest, conflict and resolution, tension and release, intrigue, and even some juicy controversy. The characters are complex, palpable, and their individual qualities can be found plotted all over the wide bell curve of the human condition. And as good as the story of Scott and Amundsen’s race to the South Pole is, it is all the more hypnotic and engaging because it is not a work of fiction. It is not a story broadcast on the narrow bandwidth of a single creator’s circumscribed imagination. It is built from the rich fabric of the real world and its infinite stock of characters and possibilities. The story is real and is, because of that, not just stranger than fiction but far more interesting. There is a multi-million dollar business in leadership training and you can spend a ton of money on books, seminars, and classroom and placement training if you feel the need. But I maintain that if you want to keep your money in your pocket and still learn the bulk of what is good and bad in leadership styles and method then The Last Place on Earth is practically the only source of information you will ever need. For Huntford’s biography is not just a fantastic story but an analysis of how and why it unfolded the way that it did; and his analysis cuts deeply into the leadership of both of the story’s main characters. The dissection is thorough and, in Scott’s case, unsparing. In The Last Place on Earth Huntford reveals Scott as a criminally negligent bungler, impaired by prejudice and governed by childish insecurities. 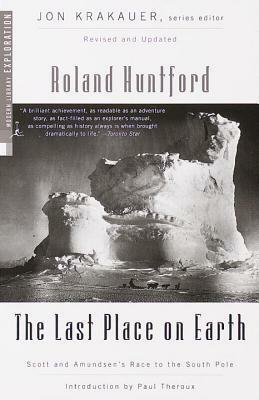 With the obvious depth of Huntford’s research and the clarity of his logical argumentation, The Last Place on Earth did much to bring what many view as a more realistic and objective image of R.F. Scott to a public, especially a British one long accustomed to the consumption of distorted and sanitized images that were in no small part the result of Scott’s own account of the expedition. By refuting with undeniable authority the claim that Scott was the victim of circumstance Huntford’s book brought low a national icon and a storm of severe protest down upon himself; and thus the book takes on with its political impact yet another dimension in a way similar to Salman Rushdie’s The Satanic Verses. On the other side of the story Huntford says little that is not downright flattering about Amundsen whose preparation, methods, and whose personal traits and attitudes are shown to be not only the main factors of his success in being the first person to stand at the South Pole, but also factors that could lead to little other than success in his or any endeavour. Amundsen, Huntford argues, had no less of an arduous task to perform that Scott and had to perform that task in essentially the same environment under the same conditions. Huntford debunks the claim that Amundsen was the beneficiary of more benign weather and easier ground than was Scott. He goes on to clearly delineate how Amundsen’s tactics were not only designed specifically and consciously to minimize risk from difficult weather and terrain but how failure to employ similar tactics made it virtually impossible for Scott to achieve his goals in all but the most benign polar environment. Amundsen built safety margins that would see him through conditions far worse than he actually encountered, Scott built margins that were inadequate for all but the most forgiving of Antarctic conditions. Most importantly, however, the tale of Amundsen and Scott is a superbly entertaining drama that will stand the test of time. It has roots deep in the soil of the human condition and speaks to us about things that we are not likely to ever lose our taste for – excitement and adventure, exploration and discovery, contest and victory, and even (especially in the case of the Edwardians) struggle and defeat. And Roland Huntford’s The Last Place on Earth is by far the most superbly crafted retelling of this story. What I learned: Don't attempt to be the first person to reach the South Pole if you don't really know anything about polar exploration. Also, stories about explorers in Antarctica are less depressing than stories of explorers elsewhere, because nobody lives in Antarctica, so there's no colonialism or genocide involved. Foolery aside, this is a fascinating book. First off - don't read this book if you really, really like Captain Robert Scott. You probably shouldn't even read it if you even have ever had a slight admiration for him. Huntford, the author, rips Scott a new one approximately 4,000 times throughout the almost 550 page book. I don't think I need spoilers in this review, as everyone already knows that Amundson the Norwegian won and Scott the Brit lost, so I'll just say it here - I was shocked to hear that technically speaking, poor Scott never First off - don't read this book if you really, really like Captain Robert Scott. You probably shouldn't even read it if you even have ever had a slight admiration for him. Huntford, the author, rips Scott a new one approximately 4,000 times throughout the almost 550 page book. I don't think I need spoilers in this review, as everyone already knows that Amundson the Norwegian won and Scott the Brit lost, so I'll just say it here - I was shocked to hear that technically speaking, poor Scott never even made it to the South Pole - they were still a few miles off when they brushed off their gloves and said, "welp let's head back." This book is basically an exacting summary of the ineptitude of the entire British expedition, the "good ol' boy" style of the British upper class that allowed Scott to even get the expedition started, and the unbelievable tyranny of the majority - of both the British and Norwegian populace. On the contrary, Huntford heaps praises constantly on Amundson, who he seems to greatly admire. It's telling that in the opening pages of the book, Huntford says he is "required to print" a statement from Scott's son complettely disavowing any connection with the book or its author. I should have realized right then that this book was going to completely throw paint on the relatively pristine wall of Scott's reputation. As far as I can tell Huntford did his homework quite thoroughly before beginning this work (and judging from the pages and pages of resources and citations in the back of the book, it appears he did) - using personal testimonies and the diaries/journals/letters that it seems everyone in the early 20th century enjoyed so much to detail just how organized Amundson was, and how Scott was not. There's only a few times when Huntford directly compliments Scott - to say that he was a brilliant writer able to capture the public's sympathy, and when talking about his vast stocism. Both of those are rather double-edged. The single time I can recall a compliment freely given is when Scott is talking to his men about science before starting out from the pole, where Huntford seems to sadly say that he missed a much safer calling that he really could have shined in. I almost wanted to give the book 4 stars for two reasons: I felt that many more diagrams, and better made, might make the reader's tracking of the two racing groups easier, and also because it really did start to wear on me with just how merciless Huntford was in biting into almost every aspect of Scott's character. And the part that perhaps Sir Peter Scott, the son, disagreed with the most was the fact that Huntford felt the need to mention that Scott's wife (Peter's mother) briefly had an affair with Amundson's Norwegian mentor while her husband was exploring the pole seemed a bit unnecessary. However, the book is worth five stars for the sheer detail and exciting way that Huntford writes. There's a lot of setup in the early part of the book (it's even set up into book 1 and 2) that was a little bit slower to read, but when the men are all at the edges of Antarctica and champing at the bit to get going, the story flows along as easily as sledges on hard packed snow. As I was browsing through a random book at Fram Museum in Oslo a few months ago, my eyes rested on a small passage of Amundsen's letter that he left at the South Pole: he was wishing all the best to the British explorer Scott, who was expected to reach the Pole later, and telling him to please take whatever supplies he needed from his camp. Fram Museum was one of the most spectacular museums that I've ever visited. It stuck with me and as soon as I was settled down again I was ready to learn more about Roald Amundsen, who now became one of my greatest idols. This book literally rewrote history and gave Amundsen the fame that he well deserves. It is spectacular showing how little "good luck" is actually needed in succeeding and how much dedication and preparation goes into a Polar exploration. The book goes through two parallel stories: the first of the Norwegian explorer, and the second is Scott's, the British. It's way more than a story of reaching the Pole, because over half the book is only about their lives up to the point of starting the expedition. At least Roald "The Last Viking" Amundsen's life up until that point is very much relevant to his success. At the same time, the book does a very careful description of why Scott failed and casts a huge shadow over his reputation as a hero. The book was pretty controversial in the UK when it was first published, and now I'm out googling what's the current thought on it. Huntford wrote the definitive book on the famous Race to the South Pole between Englishman Robert F. Scott and Norwegian Roald Amundsen. Not to give it away, but-- Amundsen won! Huntford crafted more than an historical account of the two expeditions. The Last Place on Earth intertwines the biographies of two very different men and examines their competing world views using the race as a lens. To research the book, he combed through all manner of records from military reports and bank statements t Huntford wrote the definitive book on the famous Race to the South Pole between Englishman Robert F. Scott and Norwegian Roald Amundsen. Not to give it away, but-- Amundsen won! Huntford crafted more than an historical account of the two expeditions. The Last Place on Earth intertwines the biographies of two very different men and examines their competing world views using the race as a lens. To research the book, he combed through all manner of records from military reports and bank statements to letters and the testimony of mere acquaintances. Each man receives a thorough investigation from childhood until death, as professional Polar explorers and private men. Nature could not draw a sharper contrast between two people, yet Huntford gives both their due. Most significantly, Huntford pierces the aura surrounding Robert F. Scott's life and death. Though not very successful as a naval officer, dying in Antarctica transformed Scott into the ideal hero of the British Empire. The facts prove Scott was willfully stubborn, inexperienced with polar conditions, and blinded by romantic notions of Man's Indomitable Will to Triumph. Under imperial delusions of grandeur, he trapped three men into sharing his demise. Nevertheless, he remains a revered figure in Antarctic history. Huntford gives a frank appraisal of the man, the first in the genre, with such conclusive research that every subsequent book about the journeys cannot ignore his findings. Not exactly "Scott and Amundsen" as much as "Amundsen, with a dash of Scott". The focus of this book is primarily Roald Amundsen, and with good reason. The story of Amundsen is a fascinating story of human intelligence and learning, more than grit and passion as Scott would make it seem. The book is stunningly researched with a wealth of first accounts put together in a coherent narrative that flows from adventure to adventure. It is hard to grasp the number of sources Huntford has referred to w Not exactly "Scott and Amundsen" as much as "Amundsen, with a dash of Scott". The focus of this book is primarily Roald Amundsen, and with good reason. The story of Amundsen is a fascinating story of human intelligence and learning, more than grit and passion as Scott would make it seem. The book is stunningly researched with a wealth of first accounts put together in a coherent narrative that flows from adventure to adventure. It is hard to grasp the number of sources Huntford has referred to with even the diary of a Bristol schoolgirl finding a voice. You know that at almost every point you are reading the truth. His admiration for Amundsen flows in each page and it is justified at almost every point with a dedication to tell the truth that was long obscured by Brit pride. Heroic bungler Scott is dealt with as much objectivity as one can muster, although there is the sense that his faults were explored in far more detail than those of Amundsen. Probably because Scott's were a lot more evident. I found the starting rather slow, however I think that was more because of trying exploration books for the first time. The Race for the Pole, and Amundsen's journey of the North West Passage are true legends that are done perfect justice by Huntford's masterful account. The story of the North West Passage in particular was a pleasant surprise and it is this journey that actually shows the depth of Amundsen's readiness to learn from what is available to him. Roland Huntford's take on the race to the South Pole is fascinating, often riveting. But his relentless bashing of Robert Falcon Scott gets a bit tiresome. I'm far from an expert; it seems much of the criticism of Scott is deserved if one looks strictly at what was the most efficient and safest way to the pole. Roald Amundsen is so prepared and efficient that it almost takes the fun out of his first-to-the-pole feat. Scott, who of course died on his way back after losing the race to the pole, in Roland Huntford's take on the race to the South Pole is fascinating, often riveting. But his relentless bashing of Robert Falcon Scott gets a bit tiresome. I'm far from an expert; it seems much of the criticism of Scott is deserved if one looks strictly at what was the most efficient and safest way to the pole. Roald Amundsen is so prepared and efficient that it almost takes the fun out of his first-to-the-pole feat. Scott, who of course died on his way back after losing the race to the pole, in many ways certainly seemed reckless. But there also was something sort of heroic about relying so much on simple human effort, lunkheaded and foolhardy as it might sometimes have seemed. It was obvious from Scott's own diaries that he was a bit petty and overly dramatic, and that his expedition to the South Pole was somewhat poorly organised, but this (very entertaining) book makes it sound even worse, something akin to a Laurel and Hardy movie in terms of incompetence. More than anything though, it's clear that the author really, really hates R.F. Scott. Roland Huntford hates Scott with the fire of a thousand suns. Roland Huntford hates Scott so much, it's as if Scott had taken It was obvious from Scott's own diaries that he was a bit petty and overly dramatic, and that his expedition to the South Pole was somewhat poorly organised, but this (very entertaining) book makes it sound even worse, something akin to a Laurel and Hardy movie in terms of incompetence. More than anything though, it's clear that the author really, really hates R.F. Scott. Roland Huntford hates Scott with the fire of a thousand suns. Roland Huntford hates Scott so much, it's as if Scott had taken Huntford's pet hamster and put him in a microwave and then stomped on whatever was left of it after that. Huntford hates Scott as if Scott had killed Huntford's mother personally and then insulted her a couple times for good measure. In a way, the book is more revealing of Huntford than Scott or Amundsen. Everything Amundsen does is justified and excused, whereas Huntford doesn't have a single good thing to say about Scott, to an almost comical extent. Even benign aspects of Scott's biography are seen as proof of his flaws: marrying an interesting woman is interpreted as a sign that Scott was a hen-pecked loser, for example, and every time Huntford mentions Scott's wife, his words are dripping with thinly veiled misogyny. Huntford appears to worship a particular narrow view of masculinity and 'proper' male behaviour, and those who fit it are his heroes, no matter what (Amundsen, Scott's Polar companion Oates), whereas those who reveal themselves to be too insecure, melancholic or sentimental are reviled (Scott himself, Wilson, or Amundsen's man Johansen). Strangely enough, I came out of it with a more forgiving attitude towards Scott than before. It's clear that both explorers were very flawed as human beings (like we all are) and as leaders. Amundsen made mistakes, too (such as initially starting on the Polar journey too early in the season, a decision that almost ended in disaster), and there were plenty of unsavoury aspects about his character, too. Nobody's perfect, and all pedestals are bound to crumble. But it's easier for me to empathise with Scott's indecision, his depression, his worries, his bursts of emotion, his jealousy, because he lays them bare for all to see. I feel that I know him better. Amundsen's distant, determined competence remains inaccessible to me. In the end, it's undeniable that Amundsen was the better explorer, but Scott had the better story. And even though Huntford may disagree (which would be strange for a writer, though! ), the story is actually just as important as the expedition. Going to the Pole is meaningless in and of itself: it's just a spot in a barren place. The whole point of an exploration is to let others know what you've found, and not just as data, but also to give them something to be excited and dream about. Amundsen may have been prepared for all other aspects of his journey, but if he could not tell a good story, then he neglected something very important, while Scott's people ran with it. It's a good read, though! Inspiring and detailed story of how to properly plan, prepare and execute something ambitious that hasn't been done before. Huntford has two parallel paths going: to success, and to failure. And two characters that could not be more different with more different endings to their lives. One of my favourite paragraphs at the end of the book summarises the fundamentals: 'Scott wanted to be a hero; Amundsen merely wanted to get to the Pole. Scott, with his instinct for self-dramatization, was playin Inspiring and detailed story of how to properly plan, prepare and execute something ambitious that hasn't been done before. The level of detail and research that has gone into this duography is impressive and for all adventure lovers, simply fascinating to read. I love me a good arctic adventure story and this was certainly that. A well-told tale of the two polar explorers, their two different national cultures, their different strengths and weaknesses as men and as leaders and how the complex interplay between it all had a profound influence not only on them in their time, but also on how we remember them. Synopsis: in the early twentieth century, getting to the South Pole was the challenge. Britain's Robert Scott and Norway's Roald Amundsen tried. Not too often does one come across a book that is thrill-a-minute & adrenaline pumping, is a study in planning, leadership styles & crisis management and is non-fictional, fully based on real life events. As far as personalities go, Amundsen and Scott were the proverbial poles apart. And that’s probably what set them apart in their pursuit for pole position in the race to the South pole. Huntford does a wonderful comparative character study, although his no holds barred all out attack on Not too often does one come across a book that is thrill-a-minute & adrenaline pumping, is a study in planning, leadership styles & crisis management and is non-fictional, fully based on real life events. As far as personalities go, Amundsen and Scott were the proverbial poles apart. And that’s probably what set them apart in their pursuit for pole position in the race to the South pole. Huntford does a wonderful comparative character study, although his no holds barred all out attack on Scott does get tiresome at times. Prone as he is to hyperbole and sweeping generalizations, the author still succeeds spectacularly in bringing out the magnitude of Amundsen's tour de force and leaves no stone unturned in his efforts to launch a stinging critique of not just Scott but the vainglorious stoicism of the Brits. This review has been hidden because it contains spoilers. To view it, click here. I love this book. It brings the early 20th century era of polar exploration to life. ( My edition was marred by several typos but not enough to damage the pleasure to be found in this book.) It not only covers the period leading up to Amundsen and Scott's race to the pole, but also is a detailed biography of each. The contrast between these two men is epic. Amundsen spent years preparing for travel in the polar regions. He studied those who went before, learned from the native peoples who live in I love this book. It brings the early 20th century era of polar exploration to life. ( My edition was marred by several typos but not enough to damage the pleasure to be found in this book.) It not only covers the period leading up to Amundsen and Scott's race to the pole, but also is a detailed biography of each. The contrast between these two men is epic. Amundsen spent years preparing for travel in the polar regions. He studied those who went before, learned from the native peoples who live in the Arctic, studied the equipment used and/ or needed in detail. Scott with a stereotypical Victorian British attitude just decided to give it a go because it would be good for his career. He dismissed anything to be learned from native peoples as useless to modern civilized men. He dismissed using sled dogs or skis because he couldn't be bothered to learn how best to work with either. He felt that Englishmen tethered to sled weighing several hundred pounds, dragging it hundreds of miles through the worst climate on earth was much more of a noble enterprise worthy of English gentlemen. It is a race between what we would call today, an obsessive compulsive personality and an entitled supercilious man with such defensiveness no one could tell him anything. The race was lost by Scott before it even began. The irony is that the incompetent leader who lost the race, got himself and his men killed, became a international hero, enshrined in the British Empire's pantheon of secular saints. This happened because the British were much better at public relations than the Norwegians. Sad as the outcome is, this book is a great journey of discovery. Please spend some time with it. Книга про сравнение двух подходов к проведению мероприятия, и я не понимаю, как Скотт с таким подходом в принципе дошел. This is an amazing book. It is thrilling and at the same time very interesting from the historical point of view. The only thing that may be considered a weakness is the bias that the book carries so strongly. Scott is depicted as such a feeble character in so many words that it is sometimes hard to imagine that so many people believed in his competence for so long. But it is a good, interesting and entertaining book, very well writen and highly recommended. The Last Place on Earth is an exhaustive, well-researched account of Scott and Amundsen's race to the South Pole, but I can't rate it any higher because of the author's huge bias against Scott. I get it--Scott isn't my favorite either, but contempt and loathing ooze off every page, which makes it a little hard to trust the author's conclusions. It's long and slow, like a long hike to the South Pole, but don't let that fool you. This thing is like "Antarctic Citizen Kane." Huntford takes 100 pages establishing Amundsen's skill and acumen. Then in about 40, he dismantles the myth of Scott. The book that follows from this set-up functions as a revisionist history in which Amundsen's name is elevated at the expense of Scott's mythmaking, and in between are fresh insights on how geopolitical PR campaigns have long had a lasting influence on It's long and slow, like a long hike to the South Pole, but don't let that fool you. This thing is like "Antarctic Citizen Kane." Huntford takes 100 pages establishing Amundsen's skill and acumen. Then in about 40, he dismantles the myth of Scott. The book that follows from this set-up functions as a revisionist history in which Amundsen's name is elevated at the expense of Scott's mythmaking, and in between are fresh insights on how geopolitical PR campaigns have long had a lasting influence on memory and the perception of history. In the rich world Huntford reconstructs, the quest for the South Pole is something like the space race—so much was on the line for what amounted to stepping into territory that was more or less uninhabitable. Despite his incompetence, Scott became the hero because of his literary writing style and theatrical death, and Amundsen was forgotten—becoming something like a Captain Ahab, a Citizen Kane whose Rosebud was subsumed by the utter accomplishment of his singular life goal—the South Pole. (One major question mark is Huntford's insinuation that Scott's wife had an affair with Amundsen's mentor, the explorer Fridtjof Nansen — without proper citation, this felt VERY DUBIOUS). The Last Place on Earth is the perfect antidote to the daily battering of todays drummed up drama. Real drama, real life as countries sought to be the first to discover what seemed to be the last unexplored territories. Huntford begins long before the final Antarctic contest between Amundsen and Scott. He builds each man's life story, showing how their origins, character and intent shaped their explorations and consequent success or failure. Amundsen's goal was polar exploration in the north and The Last Place on Earth is the perfect antidote to the daily battering of todays drummed up drama. Real drama, real life as countries sought to be the first to discover what seemed to be the last unexplored territories. Huntford begins long before the final Antarctic contest between Amundsen and Scott. He builds each man's life story, showing how their origins, character and intent shaped their explorations and consequent success or failure. Amundsen's goal was polar exploration in the north and he prepared relentlessly by seeking out expertise regardless of where it resided: the Eskimos, shipbuilders, dog handlers,skiers, and others who had gone before him. He signed on to other expeditions for the experience they brought. He examined and re-evaluated everything from foodstuffs to skis to sleds to tents to ship design. Scott relied on his position in the British Navy and social contacts to belay himself into positions of leadership and bail him out of setbacks. Unquestionably a great subject -- possibly a great treatment of it. Huntford consciously sets out to explode the heroic myth of Scott and raise the reputation of Amundsen, and perhaps that is a defect of the book in that the special pleading rather gets in the way. The cause stands on its own without it, as Amundsen's skill in planning and execution of polar expeditions was stellar and leaves little doubt that his successes were no accident. The one recurring theme is one that I've seen many time Unquestionably a great subject -- possibly a great treatment of it. Huntford consciously sets out to explode the heroic myth of Scott and raise the reputation of Amundsen, and perhaps that is a defect of the book in that the special pleading rather gets in the way. The cause stands on its own without it, as Amundsen's skill in planning and execution of polar expeditions was stellar and leaves little doubt that his successes were no accident. what an amazing book about extraordinary men, bravery and ambition. while this books main star is roald amundsen and its clear that the author dislikes captain scott, you cant quite blame him for that, at least if you have any idea about british polar explorations style of that time. nevertheless, this book was so much fun to read and gives good insight into history, culture, technology and society of that time. also, who wouldve thought that the world of exploration was full of drama, deceits, what an amazing book about extraordinary men, bravery and ambition. while this book´s main star is roald amundsen and it´s clear that the author dislikes captain scott, you can´t quite blame him for that, at least if you have any idea about british polar explorations style of that time. nevertheless, this book was so much fun to read and gives good insight into history, culture, technology and society of that time. also, who would´ve thought that the world of exploration was full of drama, deceits, scandals and betrayals? at the end of the day, one can just be in awe of how brave, resourceful, resilient and determined those men were. spending years in desolate, snow deserts, living with and learning from inuits, surviving out of whatever land has to give you and dealing with eternal polar nights....such a powerful story about the polar adventure and survival of simple but remarkable men. while i absolutely loved this book, it was not an easy read. lots of names, places, dates and facts to catch up with, especially in the first few chapters.